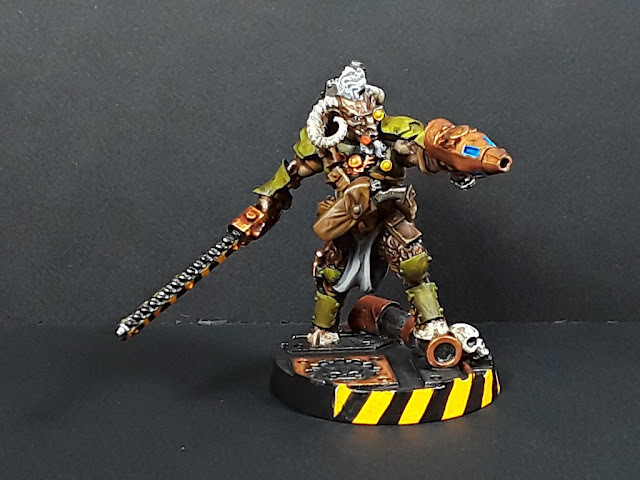 Mordian 7th Regiment: Necromunda - Gor Halfhorn complete! Figured it was time to dive back in to painting some actual miniatures after my digression into terrain, but wasn't feeling quite up to jumping right back into a full batch-painting project. So, a little speed painting session was the plan for the evening! Pulled out the model for bounty hunter Gor Halfhorn and got cracking! I knew that I wanted to do a somewhat militaristic scheme on him as a callback to the model on which it was based so settled on some camo/olive drab armour, and fairly subdued leather and metal to contrast with the more flamboyant ganger models. Of course it ain't Necromunda without hazard stripes and the model did need some spot color, so the housing of the chainsword and the various lenses got the yellow treatment, as did the front 90 of the base (as facing is important in the new edition). Lots of different brown tones on the model - the skin, the fur and the leather all needed to be distinct from one another or it'd just end up being one big smear of brown. More or less worked out! All in all I'm quite happy with him and I'm looking forward to getting my mitts on the other hired guns Forge World has previewed, as well as the new Orlocks. Really happy to have Necromunda back! Quick work there! I shouldn't be surprised , but I do really like your idea for identifying the model facing, I'll definitely be stealing that when I get hold of the Orlock gang! Thanks man! Aye, having the 90 clearly delineated on the base really does help I find! Haha! I try and do at least an hour or two of painting every day after work, so the models keep churning out! This guy took about three hours in total, I'd done the base fur and skin a couple days back so really it was just the armor plates and detailing to do. Nice nod to the original. I might chop off the muzzle of the pointy gun to make it more brutal stub nosed Plasma, but that’s personal taste. Great fur on his hindquarters. I'm thinking of replacing it with one of the Escher ones. Still haven't picked up Half-horn yet, tho (waiting until my FW free shipping coupon goes live in January), so I've got some time to consider still. Very nice job on yours! Not a bad idea - If I had it all to do over again I'd probably do the same! Loving the other three hired guns they showed off at the open day recently, really looking forward to getting them! I might have to enter the game just because of this miniature. Man this guy is cool! It really is a great game, and as an old-school Necromunda fan I am really pleased with the new edition. Would love to see what you'd do with the gang minis, John! That said, I would also argue that waiting until the rest of the main house gangs have been released is probably a decent idea. Just having Goliaths and Eschers is stifling adoption locally. I think once we see the Orlocks, Cawdor, Van Saar and Delaques hit the game will start to take off.